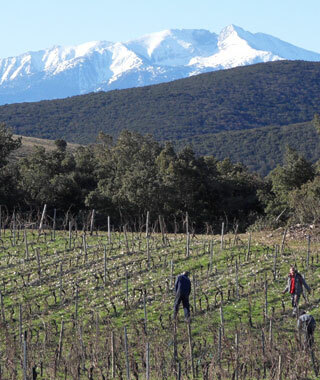 The Roussillon is becoming recognised as an identity in itself due in great part to the region's high altitude vineyards, producing fresher and lower alcohol wines than its Southern location might indicate. Wendy Paillé grew up in South Africa and remembers catching the wine bug at a young age. As soon as she could she explored the Cape wineries and then felt the calling to become a sommelier. In 2003 she moved to Virginia, where, after working in a wine shop, she went on to manage a local winery. While there she met Joseph Paillé who convinced her to move to France with him. There they married and created the celebrated Pithon-Paillé, centred on Joseph's stepfather's Anjou vineyards. Starting with work in the vines, she gravitated towards the cellar and made her first solo vinification in 2012. In 2014 she and Joseph moved to the Roussillon. Joseph created his own enterprise, Domaine Benastra, and Wendy joined le Soula as manager in 2016 where she is in full charge of the team, the cellar and our 22 hectares of biodynamic vineyards. Philippe Salvat in collaboration with Céline Schuers and Esméralda Jail work in the vineyards ensuring the health and balance of the vines. They benefit from a good knowledge of the terroir of the Fenouillèdes. Thanks to their experience and commitment the quality of the fruit from our vineyards is improving every year. In the winery, we can principally rely on Julien Kühne. He is helping in the vineyards as well when the need arises. Céline is also involved in the winery when necessary. Recently we have started to keep bees. Esmeralda looks after them as they are a hobby of hers. We now have five hives and intend to have more. Valerie deals with administrative and secretarial matters, ensuring that all the paperwork associated with running a domaine of over 22 hectares is completed correctly and on time. The meticulous work carried out in our vineyards often requires extra assistance. Seasonally, this is particularly true at harvest-time, when we employ up to 15 additional staff. Thanks to our position in the community, we are able to work with people from the local area. This allows us to employ the same team each year, which encourages good relationships, as well as experienced conscientious workers, while avoiding any unnecessary travel and its cost to the environment. In 1982 Roy and Mark founded Richards Walford and Co., specialising in fine, French wine. They quickly started to establish a reputation for working with the best winemakers in France. They have supported Soula from the start. Now, Mark is bringing his important commercial know-how to Le Soula. Gérard, together with Mark and Roy, is the creator of Soula. He discovered the terroir and at the beginning he worked the vines and was responsible for making the wines.